Getting married is one of the most exciting, yet nerve-wracking days of your life. Once your ceremony and wedding breakfast is over, you’ll be feeling more relaxed and ready to party the night away with your friends and family. Providing evening reception entertainment is the perfect way to get the party started and there are many options available to suit your style of celebration. One of the benefits of hiring a male singer or female vocalist is the variety of acts on offer. Catering for all music tastes including swing, classic hits from all eras and operatic. It is easy to search for a male or female singer that will suit your tastes. There is nothing quite like the experience of your first dance as husband and wife to live music. If you have more of a budget to play with and still like the idea of live music, hiring a wedding band can really get your guests up onto the dance floor. As with solo musicians, there are many wedding bands available in all sorts of musical genres. You will need to check with your wedding venue to make sure that there are no restrictions on live music or the space available for their setup. 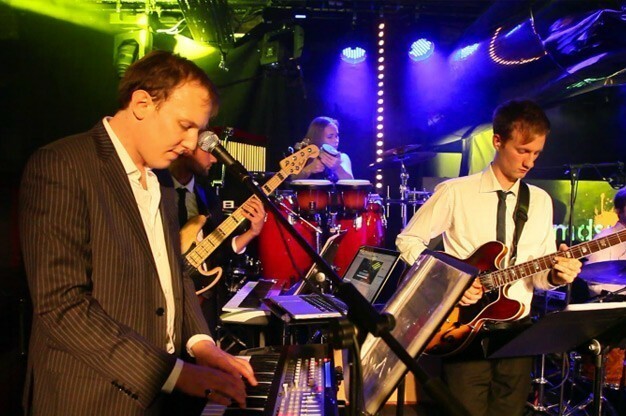 Hiring a function and party band will make any evening reception memorable. If you are both into a specific type of music that is less popular or would like to stray slightly from the norm, there are plenty of specialist bands to choose from such as Soul and Motown Bands or Ceilidh Bands for traditional Gaelic folk dancing. If there is a specific band that you both adore, check if any Tribute Bands are available to hire. A great tribute band will not only sound like the real deal, but look like them too! Popular choices as they play so many well known classics are hiring a Beatles Tribute Bands, Queen Tribute Bands & to dance the night away why not hire an Abba Tribute Band! Make your guests feel relaxed by hiring a Close Up Magician. This is a unique idea that gets your guests involved and makes your wedding reception even more magical. A Close Up magician will get everyone interested and will astound your wedding party with special illusions using cards, coins, borrowed objects and perhaps even roses! Another growing form of entertainment for wedding receptions is to hire a mentalist or mind reader. Some mentalists work the room through groups of your guests as they amaze them with their skills while others offer a mini-cabaret style show. This type of wedding entertainment will create a fantastic experience for guests that they will remember for years to come. Perhaps more suited during a drinks reception, there is no reason why you couldn’t hire a Caricaturist for your evening reception instead or both. Add plenty of fun to your party as your guests and the top table are sketched while providing a relaxed environment. You’ll be able to keep your caricatures too which give life long memories. For the ultimate performance at your wedding reception, why not hire an Illusionist? Performing in front of your whole party, an illusionist usually works with an assistant and performs jaw-dropping illusions causing your guests to look at each other in disbelief! Your guests will be sure to be asking “How did he do that?” throughout the night and give them plenty to talk about after the performance. Keep all of your guests laughing by hiring a Comedy Cabaret Magician. This style of magic is guaranteed to provide plenty of entertainment and involves magic tricks in the style of Tommy Cooper. One of the benefits to this style of entertainment is that your whole wedding party will be involved and entertained throughout the evening. For laughs without the foul language, why not hire a Clean Stand Up Comedian? This style of comedy is safe for all of the family including children and provides a cheeky performance for your guests. Comedians can be more affordable than hiring a live music act and your guests certainly won’t be expecting it! Belly dancing is a tradition that is featured in Egyptian weddings but there is nothing stopping you from adding it to your wedding reception, no matter where you are located. A belly dancer will have a set routine to follow and will sometimes get guests to join in too. This is a unique entertainment idea that will add a bit of glamour to your big day. And don’t forget the humble Wedding DJ. One of the most popular choices for weddings worldwide, the wedding DJ will play a variety of music from all eras, take requests from guests and get everyone up onto the dance floor. You can find many more entertainment ideas for your evening reception at www.EntertainersWorldwide.com – remember this is your big day so choose something that you both want as a couple that will fit in with your personalities, wedding venue and style of celebration. There are no rules but no matter what you choose, you and your guests are sure to have an enjoyable evening.